Join us Saturday, November 17 for the Stuff a Plane with Toys for Tots at the Redlands Airport Association. 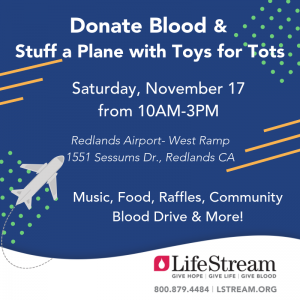 Hosted by the Redlands Airport Association, the event features aviation exhibits, music, food, raffles and your opportunity to give the gift of life by donating blood! Not only can you make a life-saving blood donation, you can learn about aviation careers and vote for your favorite car, motorcycle and aircraft on display during the Wings and Wheels Show. For entry in the event, bring in a new unwrapped toy or cash donation to Toys for Tots. The event is from 10AM-3PM on the West Ramp of the Redlands Airport. Free parking is available on Aviation Drive and Sessums Drive.